The advantages of using a Bellrest are considerable. With the bell on the leg it will raise the height of your horn approximately 1.75". We arrived at the final shape, size and design after producing a number of prototypes. Many professional horn players with years of experience in major orchestras are now using them with very positive results and have proclaimed that they will no longer play without one. The Bellrest allows you to hold your horn in a more comfortable and natural playing position. Players using one have also reported an improved quality to their sound, particularly with regard to clarity and projection. The benefits of using a Bellrest include improved mouthpiece placement, better posture and opening the torso for improved breathing. Many horn players have a lean-to-the-right posture that can contribute to back and/or neck muscle problems. The inspiration for the Bellrest design came from recognizing the need for a simple device that would provide a superior playing position. The Bellrest is a simple one-piece design, handmade from solid poplar and weighs less than 2 oz. It is finished with multiple coats of a very thin varnish. There is no mechanical fastening. An open slot with thin felt pads "grabs" the rim of the bell and holds it in place securely. 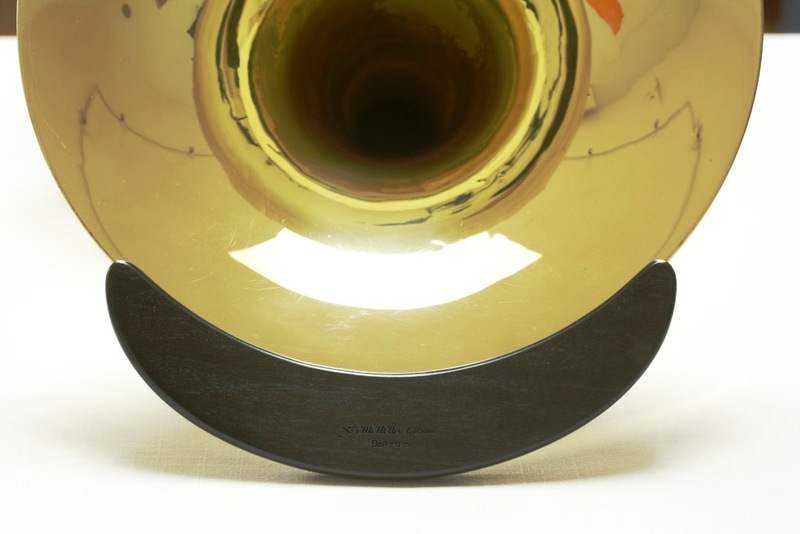 Since not all horn bells have a rim with the same dimensions we have a range of sizes available. See how to measure for a Bellrest for ordering the proper size.